(AFP) - Saudi Arabia on Saturday admitted that critic Jamal Khashoggi was killed during a "brawl" inside its Istanbul consulate, an explanation that President Donald Trump said he found credible but failed to convince top US lawmakers. The kingdom announced the arrest of 18 Saudis in connection with their probe and the sacking of two top officials linked to Crown Prince Mohammed bin Salman who has faced mounting pressure over the journalist's disappearance. Khashoggi, a critic of the Islamic petro-state's powerful crown prince and a Washington Post contributor, was last seen on October 2 entering his country's consulate in Istanbul. 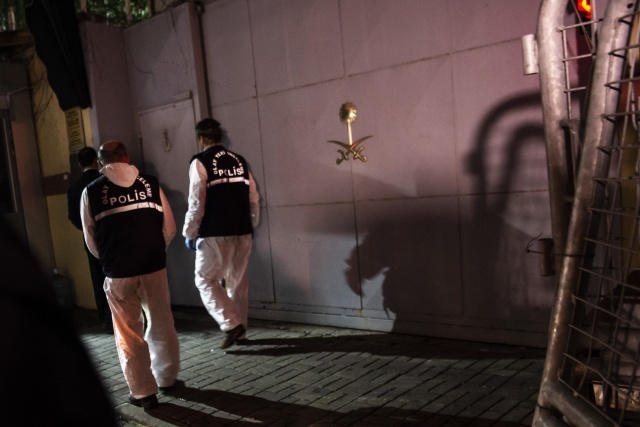 His disappearance had been shrouded in mystery and triggered an international crisis, with Turkish officials accusing Saudi Arabia of a state-sponsored killing and dismembering his body. "Discussions that took place between him and the persons who met him... at the Saudi consulate in Istanbul led to a brawl and a fist fight with the citizen, Jamal Khashoggi, which led to his death, may his soul rest in peace," the attorney general said in a statement. The Saudi king also ordered the setting up of ministerial body under the chairmanship of the crown prince, widely known as MBS, to restructure the kingdom's intelligence agency and "define its powers accurately", state media said. Deputy intelligence chief Ahmad al-Assiri and royal court media advisor Saud al-Qahtani, both top aides to Crown Prince Mohammed bin Salman, were sacked. It evolved into a major crisis for Prince Mohammed, a US administration favourite whose image as a modernising Arab reformer has been gravely undermined. US President Donald Trump said Friday that he found credible Saudi Arabia's assertion that Khashoggi died as a result of a fight. "I do, I do," Trump said when asked if the Saudis' explanation was credible, while adding: "It's early, we haven't finished our review or investigation." Trump had earlier said Washington could impose sanctions, but his administration had been notably slow to criticise the Gulf ally despite mounting evidence of what happened to Khashoggi. "It took an intense international outcry sustained for two weeks to acknowledge the obvious -- that Khashoggi is dead, that he was killed in the Saudi consulate," said Kristin Diwan, of the Arab Gulf States Institute in Washington. "That gives you an idea of the immense financial and strategic interests that are invested in maintaining the US partnership with Saudi Arabia and its leadership." But a suspect identified by Turkey was said to be a frequent companion of Prince Mohammed, three others were linked to his security detail and a fifth is a high-level forensic doctor, according to The New York Times. The decision to overhaul the intelligence apparatus and sack members of MBS's inner circle is designed to "distance the crown prince from the murder", said analysis firm Eurasia Group. But pro-government Turkish media have repeatedly claimed that Khashoggi was tortured and decapitated by a Saudi hit squad inside the diplomatic mission, although Turkey has yet to divulge details about the investigation. UN chief Antonio Gutterres said he was "deeply troubled" by the kingdom's disclosure on Saturday, adding there needed to be "full accountability for those responsible." "To say that I am skeptical of the new Saudi narrative about Mr Khashoggi is an understatement," he tweeted. Saudi Arabia's admission comes after Turkish authorities widened their probe on Friday, searching a forest in Istanbul city for further clues.